I had a professor in college who liked to ask, “Who first tied a bandanna around a dog’s neck?” He claimed it was Jesse Fripp, a classmate of mine who was then and is now much cooler than I’ll ever be. Finding a dog that is big enough to wear a real bandanna — not some dumb scarf from the groomers — and still chill enough to be low key about it is harder than it may seem (or exactly as hard as it may seem if you have spent much time around Labrador Retrievers.) Matching the dog to the outfit in just the right place at the right time takes some skill and some luck. That same professor asked a similar question about wearing baseball caps backward. 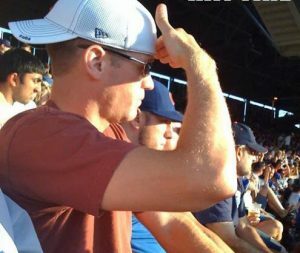 That’s an ostensibly stupid thing to do since it defeats the purpose of a brimmed cap. It can also, in the right circumstances and on the right person, be the epitome of cool. The professor’s theory was that it all started with Holden Caulfield from Catcher in the Rye. (This assumes that the catcher in the story is playing the position in baseball, which would require that he wear his hat backward to accommodate a protective mask. [And that’s a literary rabbit hole begging for exploration.]) Whether or not you find backwards caps cool may correlate with your opinion of Holden Caulfield. Opinions vary. The phenomena he’s describing are memes, discreet pieces of culture that convey larger ideas. The larger idea here being “cool.” Before the internet, it might be hard to track down the source of a meme. Who really was the first person to tie a bandanna around their dog’s neck? A meme can be imitated and passed around like a gene or a virus, and it often encapsulates a set of ideas that were already floating around in the culture. Now that we have the World Wide Web, we can often trace a picture with some words on it back to a particular source, but that meme has resonance and “goes viral” because it taps into a current that is already present in the culture. 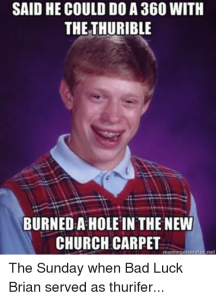 So in the spirit of my nutty professor, here’s a question: Who was the first person to protest the Church of Rome’s practice of selling indulgences that promised to shorten one’s time in purgatory? If the number of “Reformation Sunday” celebrations that have been happening are any indication, the answer is obviously Martin Luther. 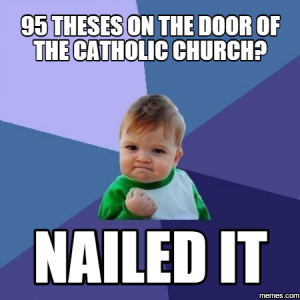 In fact, he started Protestantism by tacking up 95 debate topics to the door of the church in his college town on October 31, 1517, right? It’s a little more complicated than that. Concerns about indulgences, outrage over corruption in monasteries, divergent theologies about what happens at communion, and a push to worship in language that everyone can understand are just a few of the concerns raised by people like John Wycliffe, an English priest who lived more than 150 years before Luther and led a group that translated the Bible into the common tongue. Then there was Desiderius Erasmus, a Dutch priest who worked to produce new Latin and Greek translations of scripture, a project that raised questions for his contemporary, Martin Luther. If you read anything by Luther, it becomes clear pretty quickly that he’s a lot more than a late medieval Pat Boone, just ripping off other people’s work and making hits out of it. Luther had a talent for encapsulating the concerns that were prevalent in the culture around him. He also had the protection of an indulgent prince who was willing to shelter him from clerical and civil attacks. Luther wore that bandanna in just the right way for the moment. But whether or not you think the bandanna (or the cap, or the Reformation) is cool should not depend on what you think of Martin Luther (aka: Protestantism’s Holden Caulfield.) Reform of the church, and of the cultures in which it is embedded, is a project that began well before All Hallow’s Eve in 1517. It’s a task that the Roman Catholic church returned to as soon as it excommunicated Luther et al. Reform continues to this day. Maybe that’s the reason The Episcopal Church chooses to remember John Wycliffe on October 30. I’m not saying that The Episcopal Church’s Standing Committee on Liturgy and Music is dragging our Lutheran sisters and brothers, but The Episcopal Church’s Standing Committee on Liturgy and Music may be dragging our Lutheran sisters and brothers.